A local pastor has raised a few eyebrows after planting his church right outside a Planned Parenthood abortion clinic. 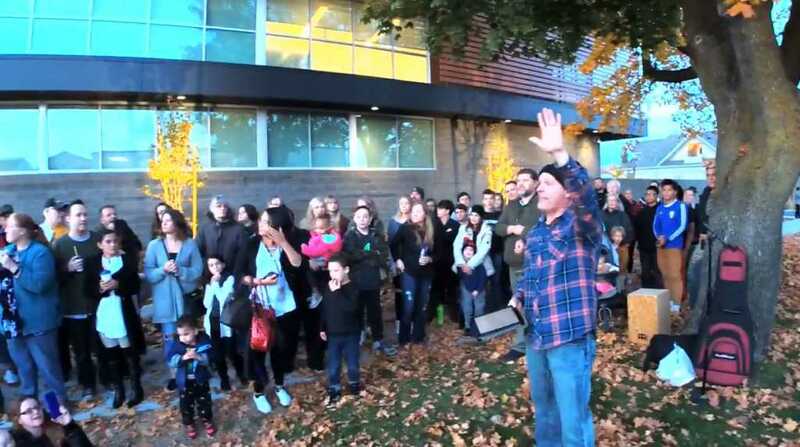 Ken Peters, of Spokane, Washington, said he felt the Lord stir in him a desire to shine the light of the Gospel into the depths of darkness and evil, and that he sensed the Holy Spirit was leading him to Planned Parenthood in order to achieve this. So, he did it. Pastor Ken, who hails from Covenant Church, Spokane, gathered together a group of faithful believers and headed over to the local clinic. But there were no signs or placards in sight — this was no protest. The Church at Planned Parenthood website makes the congregation’s mission very clear: “It’s a worship service at the gates of Hell,” a description reads. “The Church at Planned Parenthood is a gathering of Christians for the worship of God and the corporate prayer for repentance for this nation, repentance for the apathetic church and repentance of our blood-guiltiness in this abortion holocaust,” it notes. In an interview with CBN’s “Prayer Link” segment, Peters challenged Christians to face up to the injustices around us, and urged believers to confront them head-on with the power of the Spirit. Pastor Ken further recalled the moment that God spoke to him about this latest church planting initiative. He admitted that a police presence was necessary due to security concerns, but also added that his congregation is doing its utmost to “stay within the rules” with regards to where they can gather and what they are allowed to do. “We’re there to worship God. We’re there to pray. We’re there to preach the Gospel,” he said. As for the impact of the witness, Peters said it was immediate — the church’s first week attendance numbers were incredible, with tens of thousands tuning in on Facebook live. Peters called the abortion epidemic a “holocaust,” noting that Christians must seek to be salt and light in these murderous places. “This really gets the light of Jesus right out in front of the community, right at one of the busiest intersections in town,” he declared.